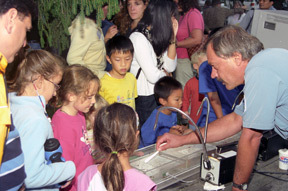 In recognition of National Healthy Schools Day on Monday, April 18, 2005, Governor George E. Pataki announced that he will introduce legislation to protect the health of schoolchildren and the environment by requiring the use of environmentally sensitive— "green"—cleaning products in all schools in New York State. The legislation fulfills a pledge that the Governor made during his 2005 State-of-the-State Address. "New York is a national leader in environmental and public health protection, and today we are continuing to lead by example," Governor Pataki said. "Our children are our most precious resource, and parents deserve to know that their children are learning in an environment that is clean, safe and free of any unnecessary and potentially harmful chemicals." "This legislation will build on the executive order that I signed in January requiring all of our state agencies and facilities to use environmentally preferable cleaning products," the Governor added. "Together, these two initiatives will help protect our environment, improve air quality in our public buildings and protect the health and safety of millions of schoolchildren, employees and visitors." The Governor's bill would authorize the State Office of General Services (OGS) to work with the State Education Department and the departments of Health (DOH) and Environmental Conservation (DEC) to develop guidance for schools on the procurement and use of environmental and health-friendly cleaning products to protect New York's school children. Schools throughout the state would be required to purchase, either on their own or through central state-purchasing contracts administered by OGS, environmentally sensitive cleaning products for use in maintaining their facilities. If passed this session, the legislation would take effect on September 1, 2006, in time for the 2006-07 school year. This effective date would allow schools to deplete their existing cleaning and maintenance supply stocks this year and to implement the new requirements in the procurement cycle for the following school year. Environment and health-friendly products have been proven to perform just as well as traditional chemical-based cleaning products and at equivalent cost, while providing the added benefits of biodegradability, low toxicity, low volatile organic compound content and reduced packaging. DEC Acting Commissioner Denise M. Sheehan said, "The Governor's executive order illustrates his deep commitment to ensuring that the health of New York's citizens and natural resources are fully protected. 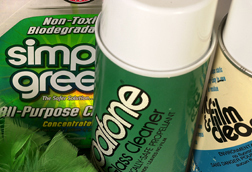 By calling for the use of these products in our schools and state facilities, Governor Pataki continues to lead by example in fostering a clean, healthy environment for New Yorkers to enjoy." Nationwide, more than 32 million pounds of household cleaning products are poured down the drain each day. Many of these products contain toxic substances that are not processed adequately by sewage treatment plants or septic systems. Studies have shown that many cleaning products in households and offices contain more than 50 potentially harmful and possibly lethal chemicals. Careless or improper use and disposal of these products may threaten individual health or lead to accidental poisoning. Long-term or cumulative environmental consequences may also occur, such as contamination of surface and ground water. In addition, research has shown that chemical cleaning products can present health concerns because they may contain chemicals associated with eye, skin or respiratory irritation and other health issues. The Occupational Safety and Health Administration (OSHA) estimates that poor indoor air quality, also known as sick-building syndrome, affects between 30 and 70 million U.S. workers and approximately 37 percent of the population suffers from chemical sensitivities, skin rashes, or allergies. Up to 30 percent of all buildings contain indoor air contamination. Indoor pollution costs more than $50 billion in the U.S. alone for healthcare, absenteeism, lost production and lost revenue. Allergic reactions to "sick" indoor air environments account for more than 10 million workdays missed by U.S. employees each year. Allergic reactions to "sick" indoor air environments keep 10,000 American children out of school each day. A U.C.L.A. study indicates that "adverse health effects have been identified regarding common chemical ingredients found in 222 cleaning products."